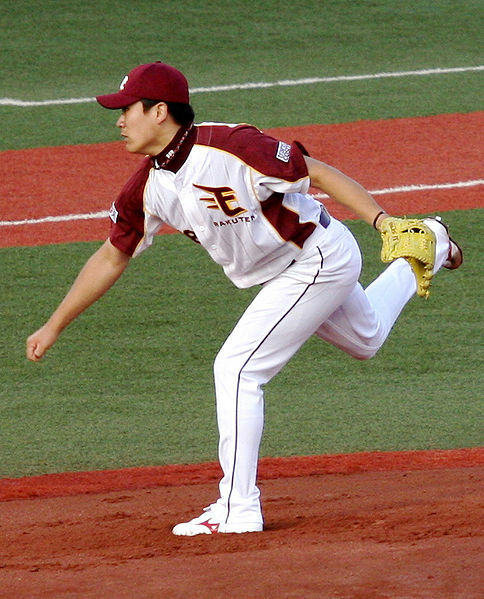 The Ratuken Golden Eagles of NPB (Japanese League) was reportedly posting pitcher Masahiro Tanaka, and he will become a free agent, available to the 30 Major League teams. The posting limit is at $20M, as per the settlement, thus opening the floor to almost every team, and it gives us a fair fight, as opposed to a bidding war between the clubs with money (you know who you are). It seems like everyone is in on this pitcher, as he’s been all over the news in MLB, and has single-handedly stalled the starting pitcher’s market. So what’s all the hype about this guy? To start, over the last 3 seasons with Ratuken, Tanaka has posted a mind-blowing 53-9 record with an ERA of 1.44, striking out 593 hitters. Just last year, he went 24-0 with a 1.27 ERA and 183 strikeouts. His 7-year career WHIP is 1.11. That alone is worth looking at, rubbing your eyes, then looking again to see if you were seeing things funny. His age is another thing to look at. He just turned 25 years old, seemingly about to enter the prime of his career. Mechanically, he seems sound as a bell. His pitching motion is comparable to Hiroki Kuroda, or really any Japanese pitcher, but more fluent and simple. Also, thankfully, sans the waiting for the pitch like Hideo Nomo or Daisuke Matsuzaka. His pitching repertoire includes a low-mid 90’s fastball that tops at about 96 with near pinpoint accuracy, a mid 80’s slider with bite and control, a low 90’s shuuto (2-seam fastball), an apparently nasty splitter/forkball in the high 80’s, a low 90’s cutter with sink, a low 70’s curveball that he seems to be slowing down, and a traditional low 80’s changeup. So, to sum it up, we have a reliable young arm, with a million different looks, and a history of taking the ball and giving his team the chance to win every night. Now, what team will he end up with? There are two major players that have emerged, the New York Yankees and the Chicago Cubs. The Yankees were the obvious favorites from the get-go. They are a notorious free-spending team (despite what they say about their “budget”), with a desperate need for consistency on the mound. Their offense isn’t exactly clean as a whistle either, but they spent on their outfield and brought in a veteran catcher who can work with pitchers well in Brian McCann. But their rotation is in shambles. CC Sabathia had a below-average year, going 14-13 with a 4.78 ERA, Hiroki Kuroda started strong but fell off in the end, and Ivan Nova has been good, but inconsistent. The remaining spots were vacated by Andy Pettitte to retirement, and Phil Hughes to the Minnesota Twins. Now, the 4 and 5 spots are being fought over within the system by David Phelps, Adam Warren, Vidal Nuno, and Michael Pineda, who started a combined 17 games last season. They clearly have money still left to spend on Tanaka, and are always on the lookout for more star-power to fill seats in the Bronx. Then, there are the good ol’ Cubbies. They have already made it public knowledge that they are going to go all out to get Tanaka, and with the Yankees on a “spending leash”, the Cubs might actually be the favorite. They spent a good amount of their offseason proving trade rumors wrong about staff ace Jeff Samardzija. The rest of their rotation is a work in progress, with Travis Wood and Edwin Jackson still with the team. The farm system of the Cubs is one of the tops in baseball, thanks to the work of Jed Howyer and Theo Epstein at the helm. Wrigley Field and the team seem like they are still under construction, and could become a big bad machine within a few years, and adding Tanaka would be a big step in the positive if they can get their paws on him. If you ask me, I think the Cubs will get him in the end. They have more expendable cash than the Yankees (shocker!) with less locked up on their roster, plus a better ballpark for pitchers, and a better future. The Yankees system isn’t widely known for nurturing young players as it is bringing in the big name, and if Tanaka were smart, he’d head to the North Side of the Windy City, because the Lovable Losers might sneak up on people soon.